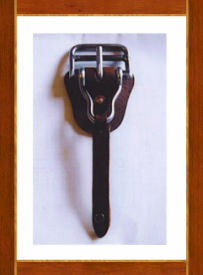 Cinch Hook is being added as standard equipment on western saddles of every size and shape. Cinch Hook is a small, completely handmade, stainless steel connecting device, that is laced through your latigos and off breed straps. You have just laced your latigo for the last time. 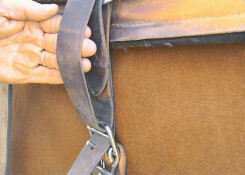 Cinch Hook remains in place on your saddle and becomes your cinch buckle. 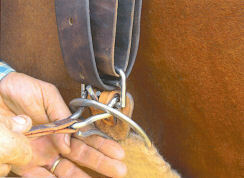 You simply connect Cinch Hook, adjust the tightness as normal, and lock. To loosen, pull your latigo and with a flip of a finger you’re undone! Cinch Hook offers a slim design, quick release and ease of saddling never offered before, yet will remain in place, stable and strong no matter what your sport. 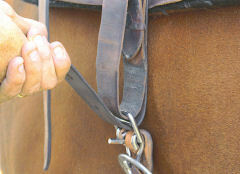 Smooth,easy pull for you with no roller to pinch your horse! Cinch Hook has been extensively field tested in every western performance discipline for strength, durability, ease of use and safety, before being offered to the public. If we wouldn’t put it on our saddle, we wouldn’t put it on yours!